In 1519, Apianus moved to Vienna and continued his studies at the University of Vienna, which was considered one of the leading universities in geography and mathematics at the time and where Georg Tannstetter taught. When the plague broke out in Vienna in 1521, he completed his studies with a B.A. and moved to Regensburg and then to Landshut. At Landshut, he produced his Cosmographicus liber (1524), a highly respected work on astronomy and navigation which was to see at least 30 reprints in 14 languages and that remained popular until the end of the 16th century. Later editions were produced by Gemma Frisius. Through his work, Apianus became a favourite of emperor Charles V, who had praised Cosmographicus liber at the Imperial Diet of 1530 and granted him a printing monopoly in 1532 and 1534. In 1535, the emperor made Apianus an armiger, i.e. granted him the right to display a coat of arms. In 1540, Apianus printed the Astronomicum Caesareum, dedicated to Charles V. Charles promised him a truly royal sum (3,000 golden guilders),1 appointed him his court mathematician, and made him a Reichsritter (a Free Imperial Knight) and in 1544 even an Imperial Count Palatine. All this furthered Apianus's reputation as an eminent scientist. Astronomicum Caesareum is noted for its visual appeal. Printed and bound decoratively, with about 100 known copies, it included several volvelles that allowed users to calculate dates, the positions of constellations and so on. Apianus noted that it took a month to produce some of the plates. Thirty-five octagonal paper cut instruments were included with woodcuts that are thought to have been made by Hans Brosamer (c. 1495 – 1555) who may have trained under Lucas Cranach, Sr. in Wittemberg. It also incorporated star and constellation names from the work of the Arab astronomer Azophi (Abu al-Husain al-Sufi AD 903–986). Apianus is also remembered for publishing the only known depiction of the Bedouin constellations in 1533. On this map Ursa Minor is an old woman and three maidens, Draco is four camels and Cepheus was illustrated as a shepherd with sheep and dog. ^1 Whether Apian ever received the promised money is uncertain; in any case he wrote a letter to the emperor in 1549 asking him to finally pay the promised sum. ^ Gislén, Lars (2017). "Apinanus' latitude volvelles - how were they made?". 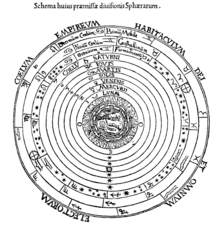 Journal of Astronomical History and Heritage. 20: 13–20. Christian Kahl (2005). "Apian, Peter (ursprünglich Bienewitz oder Bennewitz)". In Bautz, Traugott. Biographisch-Bibliographisches Kirchenlexikon (BBKL) (in German). 24. Nordhausen: Bautz. cols. 107–114. ISBN 3-88309-247-9.